Introduction Hypoxia is a microenvironmental feature in the inflamed joint, which promotes survival advantage for cells. The aim of this study was to examine the relationship of partial oxygen pressure in the synovial tissue (tPO2) in patients with inflammatory arthritis with macroscopic/microscopic inflammation and local levels of proinflammatory mediators. Methods Patients with inflammatory arthritis underwent full clinical assessment and video arthroscopy to quantify macroscopic synovitis and measure synovial tPO2 under direct visualisation. Cell specific markers (CD3 (T cells), CD68 (macrophages), Ki67 (cell proliferation) and terminal deoxynucleotidyl transferase dUTP nick end labelling (cell apoptosis)) were quantified by immunohistology. In vitro migration was assessed in primary and normal synoviocytes (synovial fibroblast cells (SFCs)) using a wound repair scratch assay. 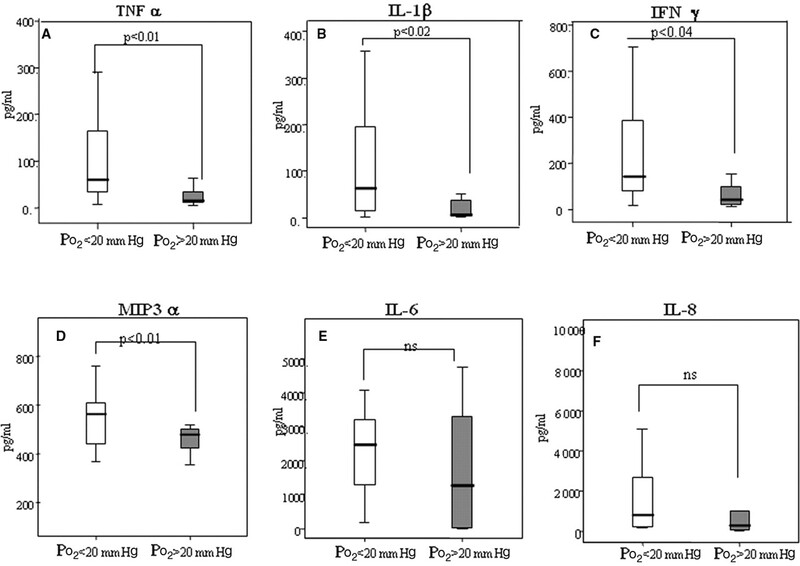 Levels of tumour necrosis factor α (TNFα), interleukin 1β (IL1β), interferon γ (IFNγ), IL6, macrophage inflammatory protein 3α (MIP3α) and IL8 were quantified, in matched serum and synovial fluid, by multiplex cytokine assay and ELISA. Results The tPO2 was 22.5 (range 3.2–54.1) mm Hg and correlated inversely with macroscopic synovitis (r=−0.421, p=0.02), sublining CD3 cells (−0.611, p<0.01) and sublining CD68 cells (r=−0.615, p<0.001). No relationship with cell proliferation or apoptosis was found. Primary and normal SFCs exposed to 1% and 3% oxygen (reflecting the median tPO2 in vivo) induced cell migration. This was coupled with significantly higher levels of synovial fluid tumour necrosis factor α (TNFα), IL1β, IFNγ and MIP3α in patients with tPO2 <20 mm Hg (all p values <0.05). Conclusions This is the first study to show a direct in vivo correlation between synovial tPO2, inflammation and cell migration, thus it is proposed that hypoxia is a possible primary driver of inflammatory processes in the arthritic joint. Recently we have described profound hypoxia in inflamed synovial membrane using a novel oxygen sensing probe in vivo.26 27 Tissue oxygen pressure (tPO2) in vivo was strongly associated with lipid peroxidation, increased vascularity, altered blood vessel stability and increased perivascular DNA damage.26 27 In this study we extend our observations to establish for the first time a direct relationship between tPO2 levels and joint inflammation, specifically T cell and macrophage infiltrates and proinflammatory cytokine expression. Patients were recruited from the Department of Rheumatology, St Vincent's University Hospital. Patients with RA and PsA, fulfilling the American College of Rheumatology28 and Classification of Psoriatic Arthritis criteria,29 respectively, were recruited. Normal synovium was obtained from two healthy controls. All participants gave fully informed consent. Patients had active disease despite disease-modifying antirheumatic drugs, had at least one inflamed knee joint and were due to commence biological treatment. Clinical and laboratory assessment included tender and swollen joint count, rheumatoid factor, anti-cyclic citrullinated peptide (anti-CCP) antibody, erythrocyte sedimentation rate (ESR), C reactive protein (CRP) and global health visual analogue scale (VAS) obtained on the same day prior to arthroscopy. Arthroscopy of the inflamed knee was performed under local anaesthetic, using a 2.7 mm needle arthroscope (Richard Wolf, Illinois, USA) and macroscopic synovitis, vascularity and chondropathy were scored on a VAS (0–100 mm) as previously described.30 ST biopsies were obtained by 2 mm grasping forceps, and subsequently embedded in optimal cutting temperature (OCT) compound and paraffin. Matching serum and SF was collected immediately before arthroscopy and stored at -80°C. Oxygen partial pressure was measured in the ST lining using a LICOX combined pO2 and temperature probe (Integra Life Sciences, Plainsboro, New Jersey, USA) under direct visualisation as recently described26 27 (supplementary figure 1A,B). A. Representative images of macroscopic synovitis in patients with low, moderate and high measures of in vivo tissue PO2 (tPO2) levels. B. Scattergraph demonstrating the inverse correlation between tPO2 and macroscopic synovitis. r, Spearman's correlation coefficient, p<0.05 is statistically significant. Synovial membrane (SM) biopsies were snap frozen in OCT compound (Tissue Tek, Sakura, Zoetrewoude, The Netherlands). Cryostat sections 7 µm thick were cut, placed on glass slides coated with 2% 3-amino-propyl-triethoxy-silane (Sigma-Aldrich, Dublin, Ireland). Synovial biopsies were also fixed in 10% formalin and embedded in paraffin. Biopsy sections 3 µm thick were cut and mounted onto SuperFrost Plus adhesive slides (Menzel-Glaser, Braunschweig, Germany). For immunohistological staining (CD3, CD68 and Ki67) tissue sections were allowed to reach room temperature, fixed in acetone for 10 min and air dried. A routine three-stage immunoperoxidase labelling technique incorporating avidin–biotin–immunoperoxidase complex (Dako, Glostrup, Denmark) was used. The sections were incubated with primary antibodies against mouse monoclonal CD3, CD68 and Ki67 (Dako) at room temperature. Sections were also incubated with an irrelevant isotype matched control. Colour was developed in solution containing diaminobenzadine-tetrahydrochloride (Sigma, St Louis, Missouri, USA), 0.5% H2O2 in phosphate-buffered saline buffer (pH 7.6). Slides were counterstained with haematoxylin and mounted. The presence of apoptosis DNA fragmentation was assessed in situ by terminal deoxynucleotidyl transferase (TdT)-mediated dUTP nick end labelling (TUNEL) assay (ApopTag Plus Peroxidase In Situ, S7101; Chemicon, Millipore, Billerica, Massachusetts, USA). Tissue sections were deparaffinised in xylene, followed by ethanol and subsequently pretreated with proteinase K. After quenching with endogenous peroxidase, equilibration buffer was carefully applied. Terminal deoxynucleotidyl transferase (TdT) enzyme was applied and incubated for 1 h at 37°C. After stop/wash buffer, antidigoxigenin conjugate was applied and incubated for 30 min at room temperature followed by incubation with peroxidase substrate for approximately 3 min. The slides were counterstained with haematoxylin and mounted. Primary synovial fibroblasts (SFCs) were isolated from synovial biopsies obtained from patients who had undergone hypoxic measurements at arthroscopy. Enzymatic digestion of synovial biopsy specimens was carried out with 1 mg/ml of type I collagenase (Worthington Biochemical, Lakewood, New Jersey, USA) in RPMI (Gibco BRL, Paisley, UK) for 4 h at 37°C in humidified air with 5% CO2. Dissociated cells were plated in RPMI 1640 supplemented with 10% fetal calf serum (FCS; Gibco BRL), 20 mM 4-(2-hydroxyethyl)-1-piperazineethanesulfonic acid (HEPES) (Gibco BRL), penicillin (100 units/ml), streptomycin (100 units/ml) and Fungizone (0.25 µg/ml) (Biosciences, Plymouth, Minnesota, USA). Cells were grown to confluence and used between passages 3 and 6. An immortalised normal human synoviocyte cell line (K4IM) (kind gift from Dr Evelyn Murphy, Vetinary College, University College Dublin, Dublin, Ireland) was used to examine the effects of conditioned media obtained from primary SFCs under normoxic and hypoxic conditions. Cells were cultured in RPMI 1640 supplemented with 10% FCS (Gibco BRL, Invitrogen, Carlsbad, California, USA), 20 mM HEPES (Gibco BRL), penicillin (100 units/ml), streptomycin (100 units/ml) and Fungizone (0.25 µg/ml). The cells were incubated and grown to confluence. To examine the effect of hypoxia on cell migration SFCs obtained from three patients, on whom in vivo hypoxia measurements had been recorded and K4IM, were cultured in triplicate and exposed to the tPO2 measurements obtained at arthroscopy to mimic the in vivo joint environment. Primary SFCs were seeded onto 24-well plates and allowed to come to confluence. A single scratch wound was induced through the middle of each well with a sterile pipette tip. Cells were subsequently exposed to normoxia, 1% oxygen and the in vivo tPO2 level for each patient. Two patients had in vivo measurements of approximately 3% and the other of approximately 5% oxygen. SFC migration across the wound margins from 12 to 24 h was assessed and photographed. To further examine the role of hypoxia on the microenvironment, K4IM were seeded onto 24-well plates and allowed to reach confluence. A single scratch wound was induced and cells were incubated with conditioned media obtained from the primary SFC cultures following exposure to hypoxia. K4IM migration across the wound margins was assessed as described above. In matched serum and SFCs TNFα, interleukin 1β (IL1β), IL6, interferon γ (IFNγ) and macrophage inflammatory protein 3α (MIP3α) were quantified by MSD multiplex assay, IL8 was quantified by ELISA (R&D Systems). SPSS V.11 for Windows (SPSS, Chicago, Illinois, USA) was used for statistical analysis. Non-parametric Wilcoxon signed-rank test and Spearman correlation coefficient were used for analysis. p Values of less than 0.05 were considered to be statistically significant. Data was expressed as median (range), unless otherwise specified. A total of 30 participants (21 with RA, 9 with PsA) with inflammatory arthritis were recruited for this study. The median age was 52.84 (27.26–80.22) years. All patients had clinically active disease, including tender joint count: 5 (0–28), swollen joint count: 6 (1–9), ESR: 23 (2–74) mm/h, CRP: 21 (4–99) mg/l, 28-joint Disease Activity Score (DAS28): CRP 4.0 (2.76–6.89), VAS: 46 (0–84) mm and disease duration: 54 (6–564) months. The number (%) of patients with circulating antibodies that were rheumatoid factor positive was 14 (47%), and anti-CCP positive 14 (47%). Macroscopic synovitis levels were 60 mm (4–100). Quantification of tPO2 demonstrates significant, and variable, levels of hypoxia 22.5 (3.2–54.1) mm Hg consistent with ambient oxygen tensions of 3.2% (0.45–7.7) (see supplementary figure 1). Paired SF pO2 measurements were higher than tPO2 levels, at 29.5 mm Hg (2–65), no relationship was found between joint fluid volume and hypoxia. Normal ST pO2 level was 39.9 mm Hg. Figure 1A shows representative images of macroscopic synovitis from patients with low, medium and high tPO2 levels, demonstrating that patients with low tPO2 have higher synovitis. The tPO2 levels significantly correlated with macroscopic synovitis (r=−0.421, p=0.02) (figure 1B) and DAS28 (r=−0.412, p=0.026, indicating higher levels of inflammation are significantly associated with a more hypoxic environment. Representative images of CD3 and CD68 staining from patients with low, medium and high tPO2 levels are demonstrated in figure 2A,C. A significant correlation was demonstrated between microscopic CD3 cell sublining expression and tPO2 (r=−0.611, p<0.01) (figure 2B) and between microscopic CD68 cell sublining tPO2 (r=−0.613, p<0.01) (figure 2D), demonstrating an inverse relationship between tPO2 levels and cell infiltration in the inflamed joint. While there is an inverse association between tPO2 and lining layer thickness (r=−0.368, p=0.059) this did not reach significance. Figure 3 demonstrates representative images of Ki67 (A) and TUNEL (B) staining, which had no association with pO2 levels, consistent with the hypothesis of impaired apoptotic pathways in the inflamed microenvironment. Microscopic synovitis and tissue PO2 (tPO2). A,C. Representative images of immunohistochemical staining for CD3 and CD68, in lining and sublining layers, from patients with low, moderate and high in vivo tPO2 levels. B,D. The correlation between tPO2 and CD3 and CD68 staining in synovial sublining layers. r, Spearman's correlation coefficient, p<0.05 is statistically significant. Ki67 and terminal deoxynucleotidyl transferase dUTP nick end labelling (TUNEL) staining in synovial tissues. A,B. 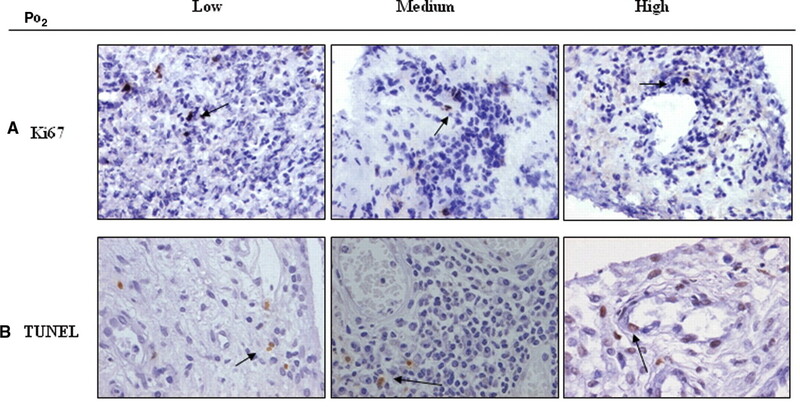 Representative images of immunohistological staining for Ki67 (top panel) and TUNEL (lower panel), in lining and sublining layers, in patients with low, moderate and high in vivo tissue PO2 (tPO2) levels, demonstrating low expression indices of both markers. Induction of SFC migration across a wound in 24-well culture plates was assessed under normoxic and hypoxia conditions. Figure 4A shows representative images demonstrating three SFC wounds exposed to normoxia, their in vivo tPO2 measurements (3% or 5%) and 1% oxygen as a positive control. Wound repair was assessed by the amount of cells migrating across the wound through direct visualisation using light microscopy (figure 4A). The first two patients had in vivo tPO2 levels of approximately 3%, exposure of their SFCs to 3% oxygen-induced cell migration across the wound compared to normoxia. We found no effect when the third patient's SFC were exposed to 5% oxygen (in vivo measurement), however induction was demonstrated at 1%, suggesting a graded hypoxic effect. Figure 4B demonstrates representative images of K4IM migration following incubation with conditioned media obtained from one of primary synoviocyte cultures exposed to normoxia, 1%, or 3% oxygen. Conditioned media-induced morphological cellular changes of K4IM, with 1% and 3% inducing K4IM migration. These experiments show a graded hypoxia effect on synoviocyte migration mimicking that of the in vivo environment. Migration assays in primary and normal synoviocytes. A. 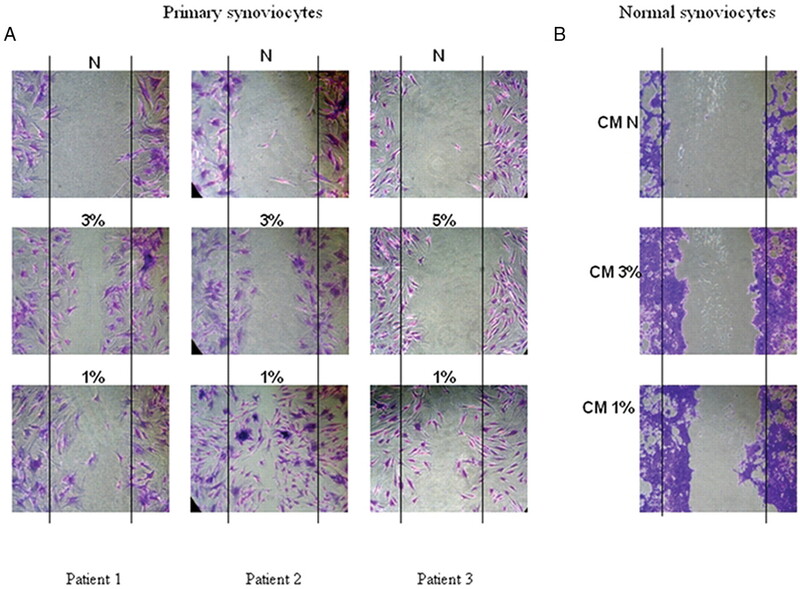 Representative images of primary synoviocytes wound repair assays exposed to normoxia (n=3), in vivo oxygen levels (n=2 at 3%, n=1 at 5%), and positive control of 1% oxygen for 24 h. Significant migration was observed when primary synoviocytes (patients 1 and 2) were exposed to 3% when compared to normoxia (A, left and middle panels), an effect that was greater at 1% hypoxia. When primary synovial fibroblast cells (SFCs) were exposed to 5% hypoxia (patient 3) migration was minimal and similar to normoxia (A right panel), migration was demonstrated when exposed to 1%. B. Normal synoviocytes cultured in conditioned supernatant from primary SFCs exposed to normoxia, 3% and 1% oxygen for 24 h before scratches. Significant migration was observed in those incubated with conditioned media from 1% and 3% hypoxic conditions. CM, cultured media; N, normoxia. SF levels were significantly higher compared to matched serum for TNFα (24.5 vs 48.3, p=0.0074), IL1β (4.64 vs 37.11, p=0.001), IL6 (20.57 vs 1384.95, p=0.0001), IFNγ (38.88 vs 107.1, p=0.001), IL8 (27.87 vs 555.51, p=0.001) suggesting localised production of these cytokine/chemokines at the site of inflammation. When results are categorised into those with tPO2<or>20 mm Hg, SF but not serum levels of TNFα, IL1β, IFNγ and MIP3α were significantly higher in patients with lower tPO2 measurements (figure 5A–D). No significant difference for SF IL6 and IL8 levels was observed. Sublining CD3 cells significantly correlated with SF TNFα (r=0.558, p=0.009), IL1β (r=0.478, p=0.033), IFNγ (r=0.51, p=0.03) and IL8 (r=0.621, p=0.031), suggesting a direct link between local expression of proinflammatory mediators and T cell infiltration, there was no significant difference in cellular infiltrate between RA and PsA. Proinflammatory cytokines/chemokines in synovial fluid and tissue PO2 (tPO2). A–D. 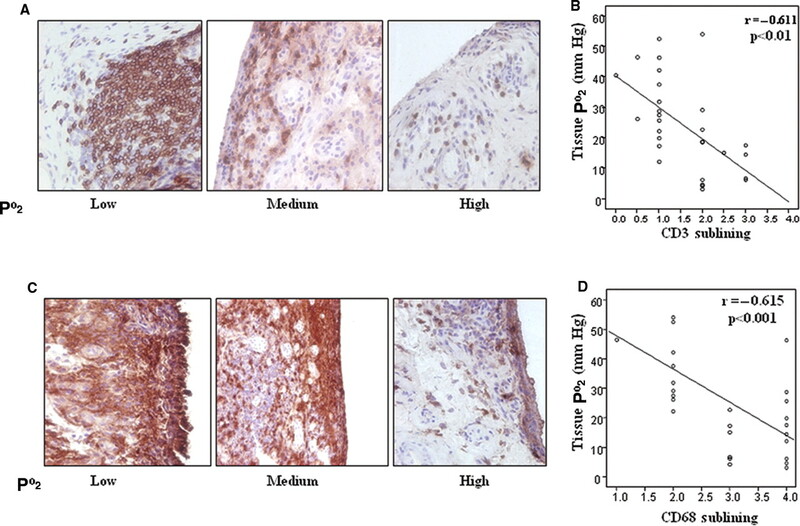 Significant differences in tumour necrosis factor (TNF)α, interleukin (IL)1β, interferon (IFN)γ and macrophage inflammatory protein (MIP)3α levels between patients with tPO2 values of greater or less than 20 mm Hg. p<0.05 was significantly different. E,F. No significant differences in IL6 and IL8 levels between patients with tPO2 values of greater or less than 20 mm Hg. In this study we demonstrate low tPO2 levels in the inflamed synovial joint tissue are significantly associated with increased markers of macroscopic and microscopic inflammation, including soluble mediators. In particular, we demonstrate a significant association of tPO2 with macroscopic synovitis, microscopic CD3 and CD68 cell infiltrate in the sublining and proinflammatory cytokines (TNFα, IL1β, IFNγ and the chemokine MIP3α), changes independent of proliferation and cell death. There was an inverse relationship between tPO2 and lining layer thickness, however this did not reach significance. Finally, in vitro primary SFCs exposed to pO2 levels, reflecting those measured in vivo in the joint, showed a significant increase in cell migration. The hypothesis that the inflamed joint is a hypoxic environment was originally suggested based on synovial cavity or SF measurements. Lund-Olesen, in 1970, used a Clark-type electrode in SF to demonstrate SF pO2 in RA knee joint (26.53 mm Hg) was significantly lower than in OA (42.92 mm Hg) or traumatic effusions (63 mm Hg),17 which was consistent with subsequent studies.18 This was supported by studies showing increased glycolytic metabolism in the joint suggestive of increased metabolic activity.18 32 33 More recently, Sivakumar et al, demonstrated low pO2 levels in patients with RA undergoing surgical tendon repair, in ST and tenosynovium, the latter being more hypoxic, suggesting different gradients of hypoxia may exist within the tissues.21 Using a novel probe we have recently demonstrated low levels of pO2 in synovial membrane under direct visualisation at arthroscopy.26 27 The present data provide the first direct evidence that the level of hypoxia is significantly associated with the degree of synovitis in the joint, with low tPO2 levels associated with increased macroscopic synovitis. The level of tissue pO2 demonstrated in the joint and its correlation with severity of intra-articular inflammation suggests a specific effect and highlights the heterogeneity of the local inflammatory environment in the joints of patients with arthritis. Consistent with previous reports, we demonstrated low proliferation and apoptotic indices in inflamed synovium although no association was demonstrated with tPO2 levels,42,–,45 further supporting the concept that cells in the inflamed joint become highly adaptive to the adverse microenvironment. T cells from rheumatoid arthritis synovial fluid show no apoptosis12 and hypoxia appears to reduce apoptosis in synovial neutrophils.46 Recently, Wijbrandts et al showed no evidence of increased apoptosis in RA peripheral blood mononuclear cell following infliximab treatment, suggesting the rapid decrease in synovial cellularity is the result of reduced cell migration and retention.47 A dissociation between invasion and proliferation in RA SFCs in vitro has been reported13 conferring a survival advantage to synoviocytes which may result from impaired apoptotic pathways, including somatic mutations in p53.48 Hypoxia can induce antiapoptotic pathways in synoviocytes, an effect inhibited by TNFα and IL1β.49 In this context, our data support the hypothesis of a complex hypoxic microenvironment, with enhanced cell migration and reduced apoptosis which may maintain a chronic inflammatory response. Hypoxia may result from high metabolic demand, however raised intra-articular pressures during movement or joint swelling,50 may also compromise synovial vascular supply further exacerbating the hypoxic environment.51 In a mouse model of arthritis, markers of hypoxia were observed in synovium at the preclinical stage, and positively correlated with synovitis, suggesting hypoxia is a primary event. In summary, we have shown, for the first time, that tPO2 significantly correlates with macroscopic and microscopic inflammation, local production of proinflammatory cytokines, chemokines and cell migration. These data provide evidence suggesting that hypoxia may be an initiating factor in driving synovial inflammation. This work was supported by a Translational Research Award Grant from the Health Research Board of Ireland.
. Epidemiology of rheumatoid arthritis. Rheum Dis Clin North Am 1995;21:589–604.
. Psoriatic arthritis. Historical background and epidemiology. Baillieres Clin Rheumatol 1994;8:245–61. Harris ED Jr. Rheumatoid arthritis. Pathophysiology and implications for therapy. N Engl J Med 1990;322:1277–89.
. Cartilage and bone metabolism in rheumatoid arthritis. Differences between rapid and slow progression of disease identified by serum markers of cartilage metabolism. J Clin Invest 1995;95:1071–7.
. Synovial histopathology of psoriatic arthritis, both oligo- and polyarticular, resembles spondyloarthropathy more than it does rheumatoid arthritis. Arthritis Res Ther 2005;7:R569–80.
. Evolving concepts of rheumatoid arthritis. Nature 2003;423:356–61.
. Immunohistological analysis of synovial tissue for differential diagnosis in early arthritis. Rheumatology (Oxford) 1999;38:1074–80.
. Activation of synoviocytes. Curr Opin Rheumatol 2000;12:186–94.
. Fibroblasts from different sites may promote or inhibit recruitment of flowing lymphocytes by endothelial cells. Eur J Immunol 2009;39:113–25.
. Synovial fluid leukocyte apoptosis is inhibited in patients with very early rheumatoid arthritis. Arthritis Res Ther 2006;8:R120.
. Cartilage destruction mediated by synovial fibroblasts does not depend on proliferation in rheumatoid arthritis. Am J Pathol 2003;162:1549–57.
. Regulation of apoptosis in fibroblast-like synoviocytes by the hypoxia-induced Bcl-2 family member Bcl-2/adenovirus E1B 19-kd protein-interacting protein 3. Arthritis Rheum 2007;56:2854–63.
. Influence of hypoxia in inflammatory synovitis. Ann Rheum Dis 1998;57:703–10.
. A comparative study by morphometry of the microvasculature in normal and rheumatoid synovium. Arthritis Rheum 1991;34:1508–13.
. Oxygen tension in synovial fluids. Arthritis Rheum 1970;13:769–76.
. Synovial fluid pH, lactate, oxygen and carbon dioxide partial pressure in various joint diseases. Arthritis Rheum 1971;14:475–84.
. VEGF release is associated with reduced oxygen tensions in experimental inflammatory arthritis. Clin Exp Rheumatol 2002;20:799–805.
. The transcription factors hypoxia-inducible factor 1alpha and Ets-1 colocalize in the hypoxic synovium of inflamed joints in adjuvant-induced arthritis. Arthritis Rheum 2004;50:291–6.
. Synovial hypoxia as a cause of tendon rupture in rheumatoid arthritis. J Hand Surg Am 2008;33:49–58.
. Expression of hypoxia-inducible factor 1alpha by macrophages in the rheumatoid synovium: implications for targeting of therapeutic genes to the inflamed joint. Arthritis Rheum 2001;44:1540–4.
. Hypoxia-induced production of stromal cell-derived factor 1 (CXCL12) and vascular endothelial growth factor by synovial fibroblasts. Arthritis Rheum 2002;46:2587–97.
. Hypoxia appears at pre-arthritic stage and shows co-localization with early synovial inflammation in collagen induced arthritis. Clin Exp Rheumatol 2008;26:646–8.
. Hypoxia-mediated activation of Dll4-Notch-Hey2 signaling in endothelial progenitor cells and adoption of arterial cell fate. Exp Cell Res 2007;313:1–9.
. Angiogenesis and Blood vessel stability in Inflammatory Arthritis. Arthritis Rhem 2010;62:711–21.
. Quantitative microscopic analysis of inflammation in rheumatoid arthritis synovial membrane samples selected at arthroscopy compared with samples obtained blindly by needle biopsy. Arthritis Rheum 1998;41:663–9.
. In vitro studies on human synovial membrane; a metabolic comparison of normal and rheumatoid tissue. Br J Exp Pathol 1956;37:318–23.
. An investigation of the abnormal metabolic status of synovial fluid from patients with rheumatoid arthritis by high field proton nuclear magnetic resonance spectroscopy. FEBS Lett 1993;317:135–8.
. Synovial macrophages as a biomarker of response to therapeutic intervention in rheumatoid arthritis: standardization and consistency across centers. J Rheumatol 2007;34:620–2.
. A prospective, randomised, placebo-controlled study to identify biomarkers associated with active treatment in psoriatic arthritis: effects of adalimumab treatment on synovial tissue. Ann Rheum Dis 2009;68:1303–9.
. Synovial tissue sublining CD68 expression is a biomarker of therapeutic response in rheumatoid arthritis clinical trials: consistency across centers. J Rheumatol 2009;36:1800–2.
. Hypoxia augments cytokine (transforming growth factor-beta (TGF-beta) and IL-1)-induced vascular endothelial growth factor secretion by human synovial fibroblasts. Clin Exp Immunol 1999;115:176–82.
. Regulation of cytokine-induced HIF-1alpha expression in rheumatoid synovial fibroblasts. Ann NY Acad Sci 2007;1108:340–8.
. Hypoxic synovial environment and expression of macrophage inflammatory protein 3gamma/CCL20 in juvenile idiopathic arthritis. Arthritis Rheum 2008;58:1833–8.
. NF-kappaB-dependent lymphocyte hyperadhesiveness to synovial fibroblasts by hypoxia and reoxygenation: potential role in rheumatoid arthritis. J Leukoc Biol 2003;73:525–9.
. Hypoxia-inducible factor regulates survival of antigen receptor-driven T cells. J Immunol 2003;171:6534–40.
. Matrix metalloproteinase 9, apoptosis, and vascular morphology in early arthritis. Arthritis Rheum 2001;44:2024–8.
. Apoptosis and p53 expression in rat adjuvant arthritis. Arthritis Res 2000;2:229–35.
. Synovial fibroblasts: key players in rheumatoid arthritis. Rheumatology (Oxford) 2006;45:669–75.
. Apoptosis in rheumatoid arthritis. Curr opin Rheumatol 2003;15:274–9.
. Neutrophil apoptosis in rheumatoid arthritis is regulated by local oxygen tensions within joints. J Leukoc Biol 2006;80:521–8.
. Analysis of apoptosis in peripheral blood and synovial tissue very early after initiation of infliximab treatment in rheumatoid arthritis patients. Arthritis Rheum 2008;58:3330–9.
. Somatic mutations in the p53 tumor suppressor gene in rheumatoid arthritis synovium. Proc Natl Acad Sci USA 1997;94:10895–900.
. p53 in rheumatoid arthritis synovial fibroblasts at sites of invasion. Ann Rheum Dis 2003;62:1139–44.
. Comparative study of intra-articular pressure dynamics in joints with acute traumatic and chronic inflammatory effusions: potential implications for hypoxic-reperfusion injury. Ann Rheum Dis 1991;50:917–20.
. Direct assessment of synovial blood flow and its relation to induced hydrostatic pressure changes. Ann Rheum Dis 1989;48:281–6. Ethics approval This study was conducted with the approval of the St Vincent's University Hospital, Medical Research and Ethics Committee, Elm Park, Dublin, Ireland.